I don't think we hit 80 degrees today...it was glorious outside. Fall is near, as the leaves are starting to change and drop from the trees. Autumn is my favorite season, by far, while summer is my least favorite, other than traffic is much lighter (no school) so my drive to work is easier. Needless to say, I am more than ready to be rid of hot, humid days! 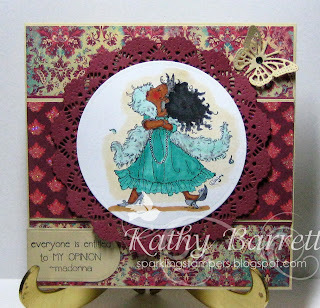 The image is entitled "Diva" and was created by Mo Manning for Stamping Bella. While not a new image, I saw it on a blog and just had to have it for this purpose. My friend always dresses and accessorizes so well. 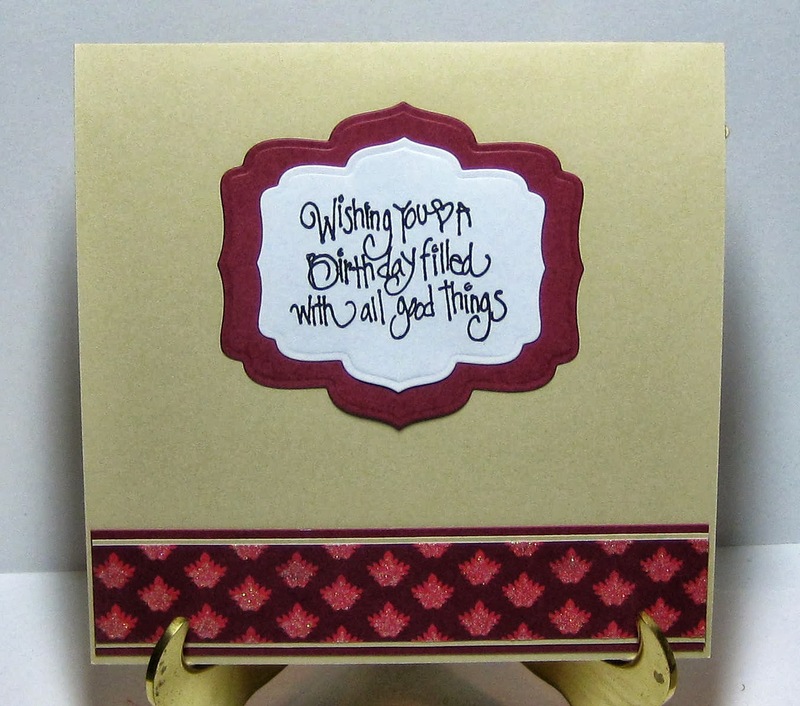 The sentiment, though not birthday-like, fits her to a T. DP is KaiserCraft Gypsy Sisters while cs is Michaels and SU. I colored the image with COpics and Spicas, adding Smooch Pearlized Top Coat to her boa. The doily and butterfly are Cheery Lynn dies, while the sentiment is cut out with an MFT die. I added a teal Swarovski to the butterfly, to pick up on the color of the dress and the teal in the background paper. I used a sketch created by Melissa on the Filipino scrapbookers challenge. Here's a shot of the interior, the birthday part of the card!!! Totally Papercrafts - Happy Birthday Baby! Thanks for stopping by! I'll be back on Monday. What a beautiful stamp and beautifully colored. No wonder your co-worker wanted it the minute it was finished! Isn't she a fun image! I can see why she had to make it into your stash. Your butterfly and doily are so intricate, delicate, and perfect for this lovely feminine card. Thank you for playing along with us at Cut It Up: Going in Circles challenge. What a fun and fabulous card! Love the layering and the quote is perfect for the stamped image. Great job!!! Beautiful card and I love that sentiment. Thanks for playing along with us at Parade Your Crafts. Hope to see you next challenge. How sweet that your co-workers fave part of her birthday is the card! Warms my heart too! Fabulous card as well, I bet she loved it!!!! Thanks for playing at CIU! Wonderful card! Such a cute image! Thanks for joining us at Cut It Up!